The company recently became a partner of Cyrus W Motors (W – wolf, which translates as “wolf”) – Lebanese car brands, the first Arab manufacturer luxury cars in the Middle East, which has brought together engineers from Magna Steyr Torn and designers from Studio Torino. The first model was the company’s super car Lykan Hypersport, it has become the first buyer of Qatar, Sheikh Hamad bin Javan Al-Thani. A car accelerates to 100 km / h in 2.8 seconds, can reach speeds of up to 385 km / h Engine output is 750 Lykan Hypersport forces. Layout of the car, valued at 3.4 million dollars, will be exhibiting at booth Syrus at the annual exhibition in Basel. 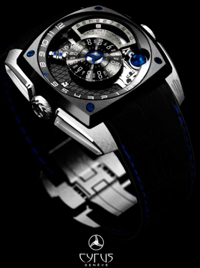 The cooperation of the two brands will be released in limited edition watch – 7 copies. In the same edition and limited edition car. The model is built on the basis of an automatic mechanism CYR598, which consists of 390 parts. Special feature of the collection Klepcys – use volume indicators of time and phases of the moon. Diameter of three-dimensional blue moon – 6 mm. Caliber is inserted into the body, made of white gold. Complements its crocodile leather strap with blue stitching. Probably, the main feature of the model are the fingerprints watchmaker Jean-Francois Mozhona on back of the watch.